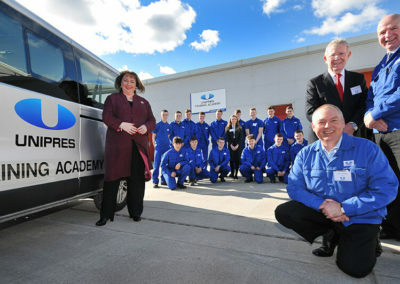 A production line for apprentices, The Unipres Training Academy will roll out the next generation of automotive experts. Kitted out with state of the art training equipment and manned by experienced Unipres engineers, the Academy provides a perfect simulated manufacturing environment. Current, factory-standard robotic equipment complements a modern learning environment, where future engineers are introduced to Unipres manufacturing. Apprentices will receive hands-on training in welding, health and safety, work procedures, equipment start-up, labelling and quality systems, as well as addressing any needs in basic skills such as literacy and numeracy. 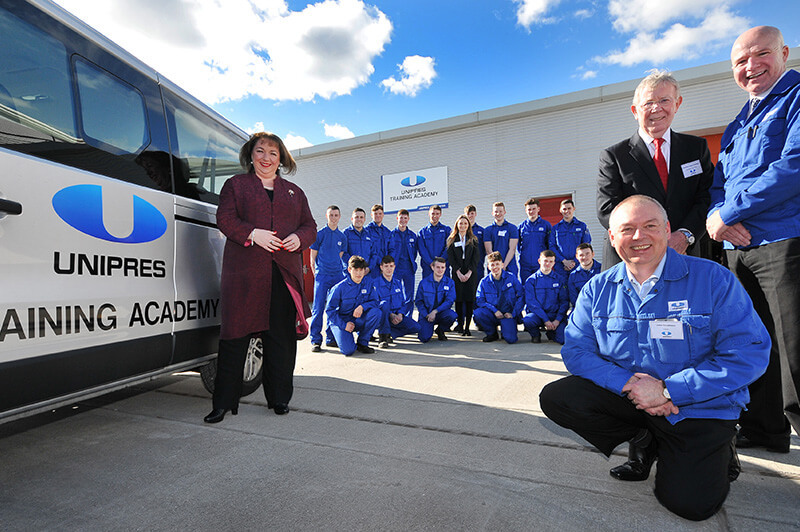 The Training Academy is a launchpad for not only Unipres trainees and apprentices, but those who will futureproof the North East automotive sector for generations. 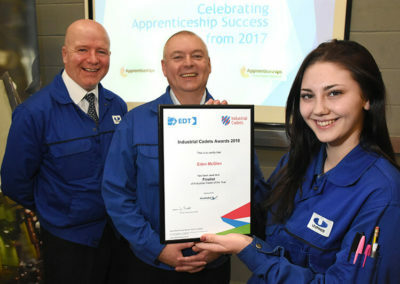 Unipres Launched its Training Academy in 2017, following a week of activities with schoolchildren, more experienced students and the firm’s own new apprentices. Officially opened by Washington and Sunderland West MP Sharon Hodgson, the launch saw dignitaries from the worlds of business and education, as well as the leader of Sunderland City Council receive a guided tour of the facility and even try their hand on some of the machines. A unique partnership approach, that brings together Unipres, Sunderland College, Job Centre Plus and agencies Pin Point Recruitment and Blue Arrow, the Sector Based Work Academy delivers a 4-week programme to more than 150 people each year, with the aim of offering every learner a paid role at the end of their course. The only requirements from each trainee are basic English and maths qualifications, along with a can-do attitude. 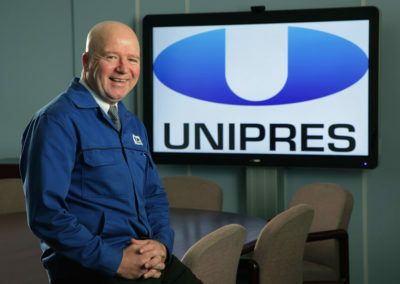 The rest, they learn as they embark on this hands-on programme at the Unipres Training Academy, and its Washington plant, home to more than 1,200 employees. 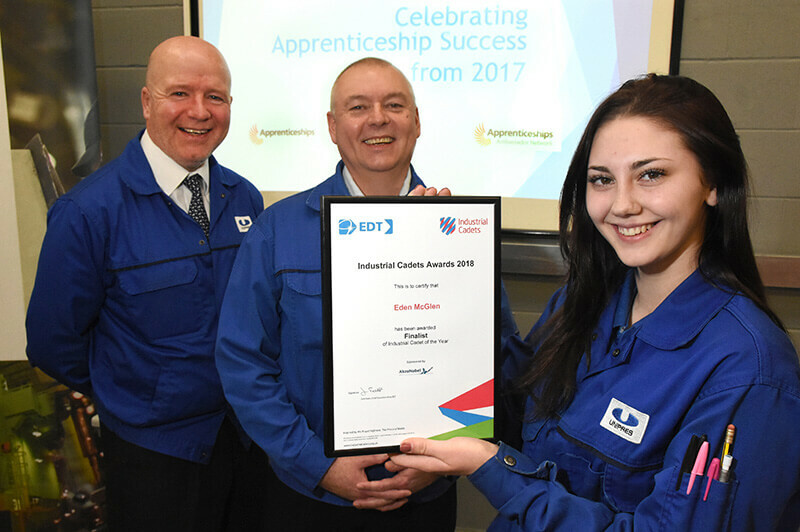 Unipres is proud to partner with Hartlepool College, which delivers high-quality training to our talented apprentices, like maintenance apprentice, Megan Gorman. 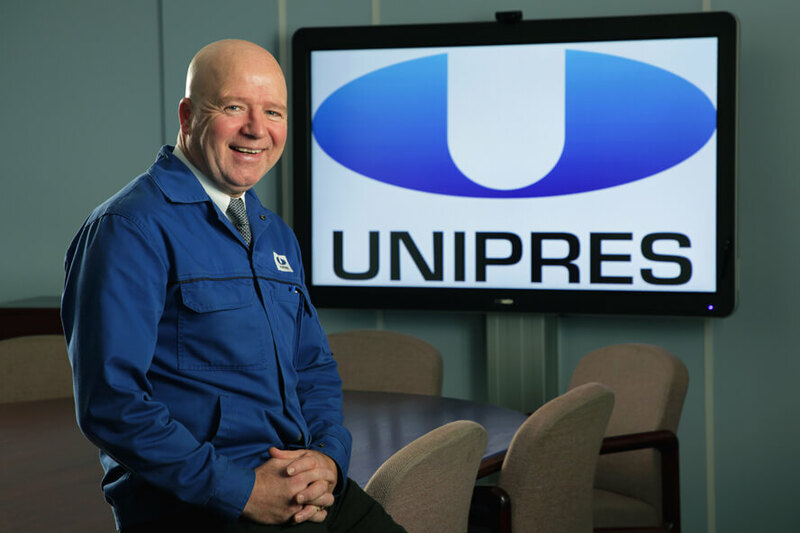 Megan and Unipres UK Ltd Operations Director, John Cruddace, feature in the college’s fantastic new promotional video “Hartlepool College Life”, which showcases the way it works with business to give students a fantastic learning experience. Unipres employs cutting edge technology at the Training Academy to ensure all apprentices receive the best learning experience possible, such as VR welding tech, seen here.